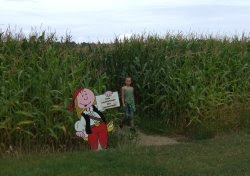 The Pirate's Maze is only a short step from Dinan, St. Malo and Dinard on the Rance Valley. I had a lovely afternoon out at this maze with some friends and their children. The mazes were excellent, there were four in all. Each maze had a set of 10 questions to be answered by finding the question boards in the right order. These questions added interest at the same time as guiding you through the maze. We split into teams so it got a bit torrid rushing from board to board. When you finally reach the centre of the maze there is seating and snacks for the exhausted adults and great outdoor games for the younger ones which kept them entertained for at least another 30 minutes whilst we caught our breath and got ready for the next maze. The kids had a lovely time and were kept busy for the whole afternoon. It was very good value for money (entrance fee approx 7 euros each). There were also pic-nic tables near to the car park and we were allowed to go out, have our lunch and then return leaving all the pic-nic stuff in the cars. Some of my favorite days out and things to do in Brittany. 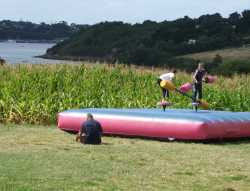 Activities for children and adults in the Brittany region of France. Contributions welcome. I have lived in Brittany for 17 years. I am English but have not lived in England since I was nine years old. I spent my teenage years in the Channel Island of Jersey and at the age of 23 I decided to sell my car and what goods I had to go and discover Europe (and myself) in a camper van with two friends. We travelled for a year taking in France, Portugal, Spain and Marocco along the way. I settled in Holland. My partner and I moved to France in 1991 and started renovating an old farm which we have turned into a successful gite complex over the last 17 years. Bernard and I separated three years ago but still work and run our Gite buisness together.